The Austin Wall as seen from the main lobby of the Austin Federal Courthouse. 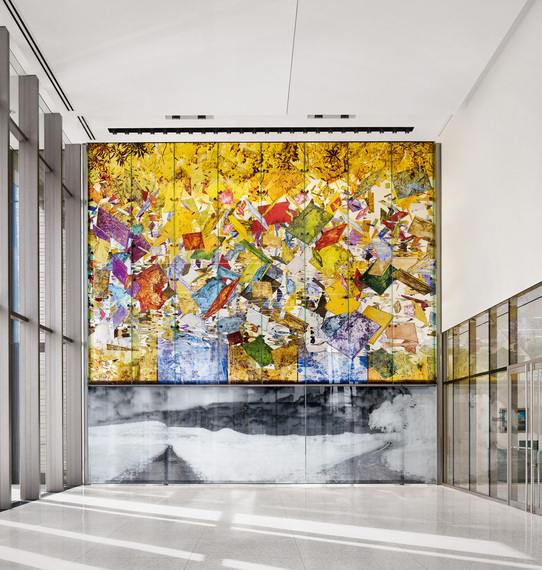 This is the second half of my interview with the artist Clifford Ross, focusing on his stained glass "The Austin Wall," a most striking 800 square foot window in the new United States Federal Courthouse in Austin, Texas. 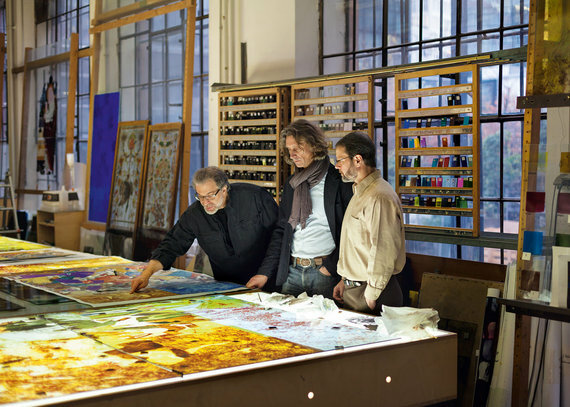 Clifford Ross and Michael Mayer review artwork in Munich. Elizabeth Sobieski: You worked with Michael Mayer of the esteemed stained glass and mosaic studio, Franz Mayer of Munich, formerly stained glass artists to the Holy See. How did this come about and did the GSA or the judges have any problem with "The Austin Wall" being 'Made in Germany'? 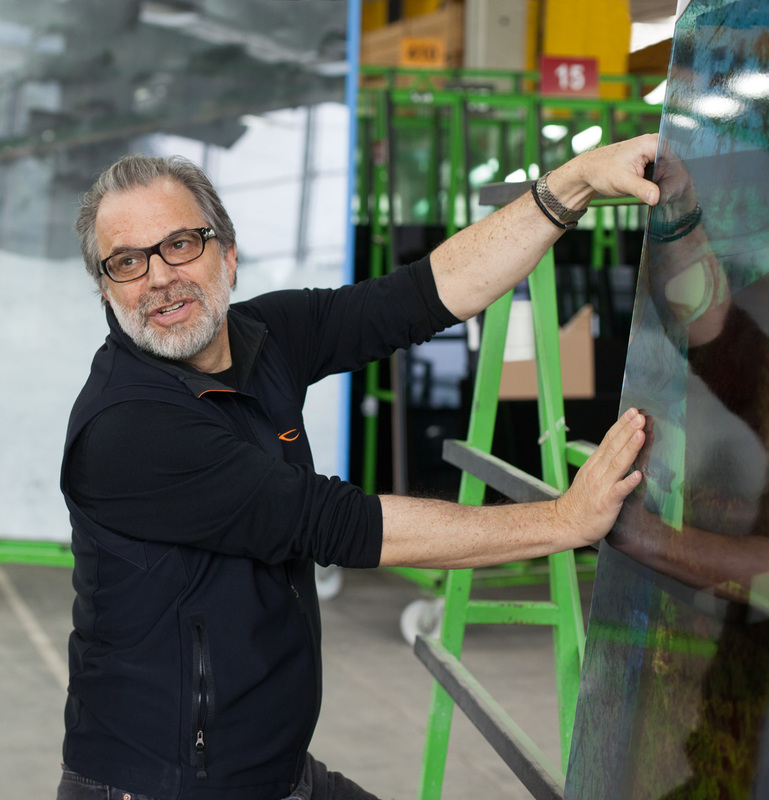 Clifford Ross: Frankly, I looked at a number of stained glass manufacturers in the United States because I felt I had an obligation to see if it was something that could be "Made in America". I went all the way to the West Coast looking and although there are a number of excellent domestic glass workshops, none had undertaken anything as artistically complex or massive. There was no choice really. Having been introduced to Franz Mayer by Kiki Smith, and knowing that the Starns were then currently working with them on a major glass installation for the New York City MTA, I felt comfortable with the selection of a non-U.S. firm on the basis of need. The chemistry between Michael Mayer and myself was instantaneous -- he was clearly intrigued with taking a risky and adventurous journey with me. The architects, Mack Scogin and Merrill Elam, were also enthusiastic, having considered the firm for another project. Certain crucial elements of our space program, national defense, and other federal projects embrace manufacturing partners around the world as needed, and so why not here? ES: You have a history of inventing new technologies as you create. 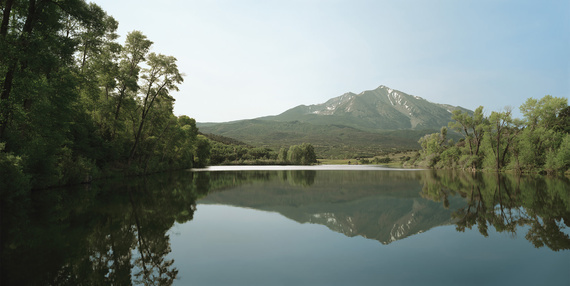 When conventional cameras failed to provide enough resolution to capture the details of Colorado's Mount Sopris, you patented a camera, the R-I. Did you come up with anything they had never seen before in Munich? 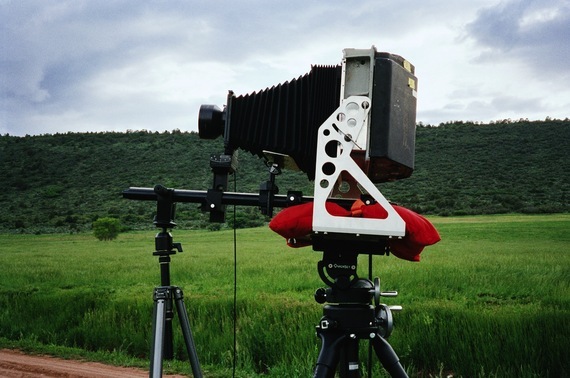 R1 Camera by Clifford Ross. CR: This is a real point of pride for me. I think Michael was deeply intrigued by the complexity of what I was aiming for, and especially interested in working with me because my imagery was going to require a re-invention and re-combining of stained glass techniques. I had no knowledge to bring to the table, and he had six generations of knowledge behind him as well as a remarkably facile way of thinking about glass as a medium. So I think it's safe to say that together we created a new vocabulary for stained glass -- using not only new combinations of techniques, but even in regard to the structural engineering of the three and a half ton wall. I think we burned through three structural engineering firms with the architects! ES: Half the original glass was destroyed by a forklift in transit and had to be re-made. 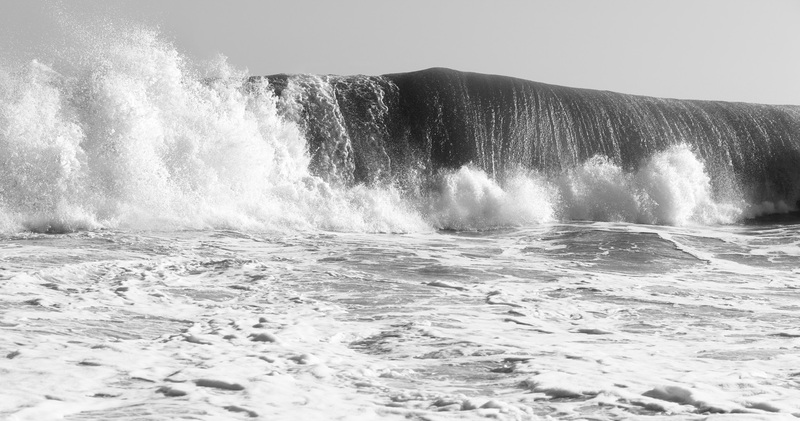 That must have been shattering, pardon the pun. How were you able to replace the broken elements so rapidly, completing the project on schedule? CR: A combination of keeping cool and an insanely willful determination to meet our obligation. Michael and I decided to buckle down and see if we could pull off the almost impossible task of replicating 40 percent of the highly nuanced upper portion in a manner that would not be seen by the naked eye -- a tremendously difficult task because if you fire a particular glazing on two different days, with even slightly different humidity or temperature during the application and firing, it can result in a materially different color. Not to mention matching brushstrokes that crossed from one panel to another! Michael has a very deep keel in the water, and I credit his personal response to the pressure as key to our success. ES: I witnessed "The Austin Wall" in the morning and the afternoon from both sides and noted how its glimmer and transparency changed throughout the day. I was also knocked out by how striking it was from outside the building in the evening when entirely artificially lighted. Were you able to test the lighting effects before installation? CR: We were, and I credit the judges, GSA, and the general contractor with backing what I saw with Michael, Mack and Merrill -- a need to re-engineer the lighting, which had become less than what we had hoped for during the always necessary processes of value engineering and construction. ES: The black and white panels have an underlying dotted pattern. Are those pixels or something intrinsic to the glass? CR: The image on the lower panels in black and white are made with a simple halftone technique common in magazine illustration -- and I suppose, it is the simplest of the stained glass techniques we used. But to use that simple technique properly at this scale took months of Photoshop work in my studio and a very novel method of juxtaposing black and white layers of printing on the glass so that we met the judges criteria for allowing visitors to see through the image of the Austin Hill Country and that there was life and movement on the other side of the glass wall. ES: This is not your first experience with civic art. I remember seeing the two large photographs, one of startling hurricane waves and one of majestic mountains, that you donated to the U.S. Mission to the United Nations through FAPE, the Foundation for Art and Preservation in Embassies. (The mountain couldn't fit inside the Mission elevator or stairs and had to be removed from its frame and placed atop the elevator for delivery!) You told me that as an artist, you want to "participate in what I say are the real goings on in the world, i.e. social, political, environmental causes." How has your experience with The Austin Wall, available for all to see whenever the courthouse is open, affected your passion for public art? CR: My appetite to make art that addresses the public -- and public issues -- has increased. I look forward to the next opportunity that presents itself, whether a public commission or just making art that addresses issues of the day -- while still being true to the feeling I have always had that the best art transcends the specifics of its time and deals with deeper spiritual and emotional issues. ES: Are you descended from Sul Ross, the colorful nineteenth century governor of Texas? Clifford Ross inspects the lower portion of The Austin Wall.